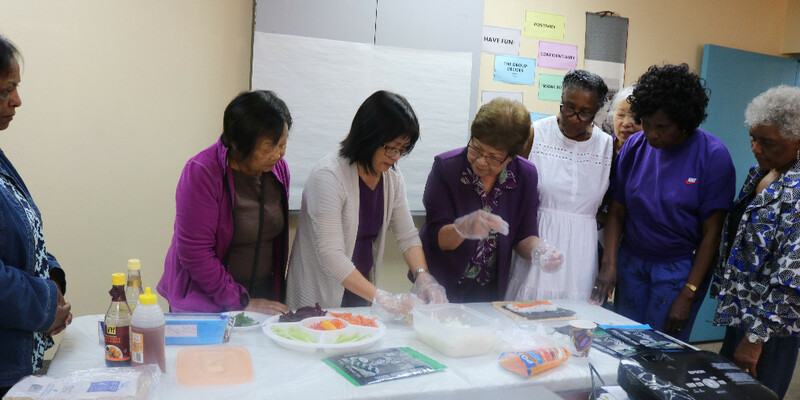 The ‘Seniors Healthy Kitchen’ project aims to actively include seniors in both planning and delivery of healthy eating by sharing their own expertise and knowledge of healthy and yet culturally ways of food preparation and cooking. This program also helps seniors to be involved in healthy food demonstrations and in nutritional awareness building workshops. The project comprises of five rounds. Each round has eight sessions and the program will run from May 2018 until November 2018. Round 1 was held at MIAG and Round 2 was held at Polycultural Immigrant & Community Services, in Mississauga. Round 3 was held in Brampton, and Round 4 and Round 5 are ongoing in Mississauga and will be finished in November 2018. The project is delivered through workshops where guest speakers such as nutritionists and other health professionals deliver their presentations in an interactive atmosphere. Seniors will exchange knowledge and practices on the impact of healthy food on health and well-being, and how to manage health issues through diet.